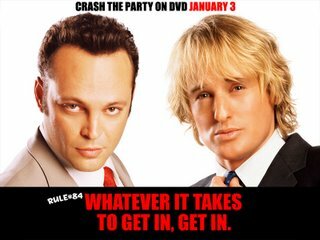 Leadership: Leadership lessons from Wedding Crashers?? Leadership lessons from Wedding Crashers?? What could these guys possibly teach us about leadership? Well, some of those rules - like rule #84 - could possibly come in useful. But the real gold from Wedding Crashers came from the special features. Director David Dobkin knows how to keep people motivated. Every day, he would pin a storyboard of the day's shooting in a prominent place, so everyone - cast, crew, extras, everyone - could see it. When each scene was shot, he'd get a quick screen capture of the scene and paste that over the hand-drawn storyboard. People could see in real time how progress was going. So everybody was part of the project. And the end product is one of the funniest films I've seen recently. Nice work, David Dobkin!